Now that the kids are back in school, I find it’s hard to rush dinner on the table after we get home from after-school activities. 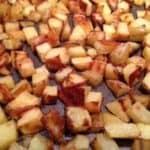 This recipe is one of my quickest, easiest recipes, plus it’s a family favorite. 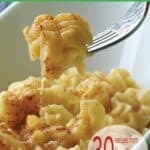 Today my mac and cheese recipe is published in the e-cookbook Mo’ Macaroni and Cheese: 30 Mouthwatering Recipes for America’s Favorite Comfort Food. 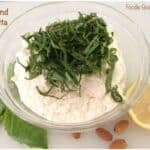 Today I am sharing the recipe for Vegan Almond Ricotta because I love the creamy texture, and this recipe is full of flavor. Nancy got the recipe from Miyoko Schinner, who wrote the cookbook Artisan Vegan Cheese,which is the bible for vegan cheese-making. 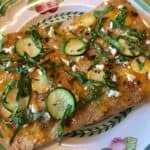 I can’t believe how quick and simple this recipe is to make. The ricotta is everything you want a soft spread to be: fresh, creamy, and flavorful. This recipe is a dream come true for anyone like me who can’t digest dairy but loves soft cheese. 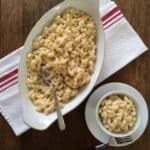 Macaroni and Cheese is always a crowd-pleaser, especially with kids. 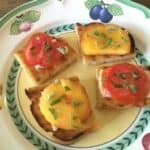 Recently, I planned a holiday food buffet with sophisticated flavors and then decided to add this dish so I could please a wider range of palates. I wanted to make a dish lower in fat so the adults wouldn’t feel guilty having some too. I took a regular recipe and lightened it up.